The American Fisheries Society is interested in you and your colleagues considering becoming Hutton Mentors for 2018! Our Mission: To increase diversity within the fisheries professions. AFS recognizes the importance of stimulating interest of fisheries science and management among groups underrepresented in the fisheries profession. Our Goal: To stimulate interest in careers in fisheries and aquatic science and management among groups underrepresented in our profession. Opportunities for scholars are available to applicants as limited by funding and mentors. The Hutton Junior Fisheries Biology Program completed another successful year in 2017. AFS provided stipends to 24 high school students and introduced them to the important and exciting world of fisheries. We need your help to continue to mentor, inspire, and enrich our Hutton Scholars. We encourage mentors to recruit students within a reasonable commute of their worksite for a perfect mentor-to-student match during the competitive student selection process. 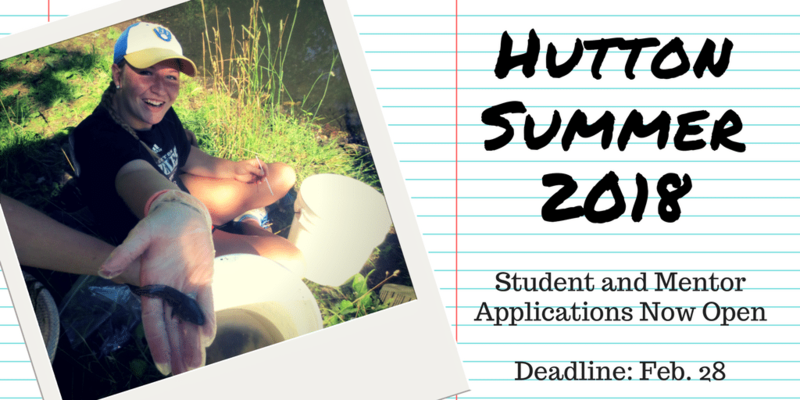 Student applications are now available online, and the students (Hutton Scholars) that are selected, after a review of the applications by the oversight committee, will be matched with fisheries professionals as mentors to learn first-hand about fisheries and aquatic science in a marine and/or freshwater setting. Mentors hold the key to engage, inspire, and enrich the next generation of fisheries professionals. To help with this, AFS staff are committed to working with mentors during the Hutton Program. A Hutton mentor partners with the student, while AFS staff provides the support for a successful experience. The responsibilities are shared, and AFS considers them as their scholars, and handles all financial and liability requirements. Submit online application with personal information and credentials. Recruit applicants, if possible, at local schools with materials provided by AFS. Meet with selected student(s) and family members to arrange for logistics for the 8-week program. Help students complete documents for AFS office, including tax forms and liability agreements. Enroll students as volunteers in local host agency or association. Provide a schedule (can be flexible) for each student to work at local work sites to complete the 8-week internship. Help with assuring timely reporting on progress and completion of program. Provide stipend of $4,000 and cover liability insurance for students. Provide oversight for the process and assistance with any problems during application or program period. Retain all records for reporting and accountability to support agreements. Provide network for students with AFS chapters and units, as well as with educational partners, for further engagement in fisheries programs. Thank you for being a positive influence and being instrumental in Hutton J.F.B Program’s mission to young scholars nationwide. Please reach out to Mohammed Hossain at [email protected] or [email protected] for any questions/concerns.